Releases that consist of one epic-length track have been a fixture of the metal scene for a long time now, to the point that many hardly deserve comment. Few have had enormous impact since the likes of Edge of Sanity’s Crimson and Meshuggah’s I EP (and later Catch Thirtythree full-length), and so it’s always something remarkable when a band does manage to create a long song that really works. Enter Gorguts, fresh after their 2008 reunion and 2013’s successful comeback album Colored Sands, noted as much for their ambition as their technical skills; it seems that a thirty-two minute song on an EP makes perfect sense, yet Pleiades’ Dust only proves this up to a point. A concept piece about the fall of the great library, the House of Wisdom, in Baghdad after a Mongol invasion in 1258, Pleiades’ Dust is divided into seven chapters, describing the formation, peak, and destruction of the House of Wisdom in typically abstract language, both lyrical and musical. Typically for this sort of ambitious project based around real-life events, you’ll probably get more from the experience having done some research of your own and listening with a lyrics booklet close to hand; yet the death metal itself is good enough to be enjoyable in its own right, a continuation of Colored Sands that has been refashioned into a single thematic and musical statement. Yes, those expecting advancement from the last album will be disappointed, as this is a step sideways, not forwards, but as an EP release it’s miles ahead of most bands’ stopgap releases. The care and attention taken is plain; each note planned and obsessed over, each new idea caressed and loved. 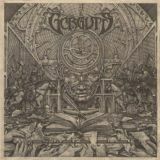 And while the death metal content itself may not be the most heaviest and brutal that we’ve heard from Gorguts, it’s interesting enough and endowed with enough atmospheric aggression to be worthy of their discography. Keeping the line-up from Colored Sands bar the replacement of drummer John Longstreth (Origin, Angelcorpse, etc) with Patrice Hamelin (Martyr, Beneath the Massacre), Pleiades’ Dust is as technically sound as you’d expect. A mid-paced rumble for much of the running, with moments of ambience here and there such as the opening seconds, and plenty of technical frills in the guitars and drums, it’s clear that the main focus of the band is the atmosphere at play. It’s hard to point to particularly excellent individual moments as a result, although such moments exist; what matters is their effect on the surrounding music. The melancholic interlude at around nine minutes in, for example, making the ensuing shift into a faster gear than elsewhere all the more engrossing. These interlude pieces are returned to through the EP, often more interesting than the general death metal due to little aspects like the drumming or to simply being more effective at portraying ancient halls of wisdom on the edge of extinction. There’s a particular, wonderful moment where the band drop to outright drone doom around the eighteen-minute mark, continuing for a few minutes then allowing a guitar riff to change tempo and build back into death metal; exactly the sort of thing that you need to keep a thirty-minute death metal track interesting, and the mark of veteran songwriters. Gorguts are an established enough name in the death metal scene, and a name enough on the intellectual end of death metal, to make a 30-minute song appealing in and of itself. It’s hard for a band that’s been so synonymous with progression in the genre to make something like this and not have it immediately blow everyone’s proverbial socks off, but the fact remains that as impressive as Pleiades’ Dust is in and of itself, it’s destined to be but a footnote in the band’s discography due to better outings elsewhere, as well as being good but nothing that we haven’t heard them do before, albeit longer. Fans will love this, and it is a great EP, but I can’t help feeling a little disappointed at being impressed rather than blown away. Chalk it up to a modern metalhead’s greed and ungratefulness at the wonders we’re constantly presented with, perhaps, but less is often more.